View More In Comforters & Sets. The MISSION: ALLERGY Premium Microfiber Fabric on the outside of these comforters is the ultimate allergen-barrier: totally effective, silky soft, and lightweight. With a mean pore size of 2 microns it blocks all allergens, yet is air-permeable, making it completely comfortable. It does not allow any allergen escape, as do many cotton barrier-fabrics. These Allergen-Proof Comforters are filled with luxurious DreamFill®, ultra-fine fibers that are as soft as silk, with superior lofting quality and a light, down-like feeling, providing softness, resilience, comfort, and warmth. 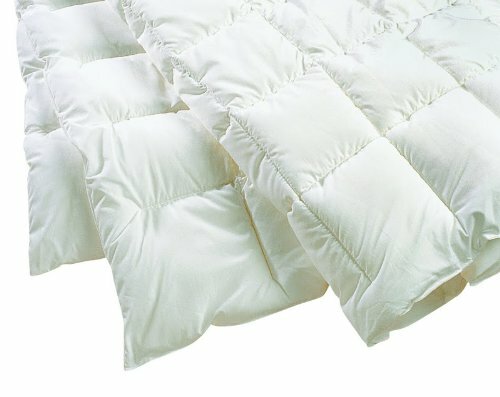 This Light-Weight Comforter has 60% of the fill of our regular DreamFill® comforters, for those desiring less warmth, or for use in place of a regular blanket. These medical-grade comforters are suitable for adults or children with allergy. 8" quilted box pattern for Queen and King; diamond pattern for Twin. Available in White, Natural and Blue-Gray; color-coordinated Shams and Bedskirts also available. 100% Woven Polyester Microfiber shell; 100% polyester filling. Note: These allergen-proof comforters are available exclusively from MISSION: ALLERGY. Do not confuse them with other comforters sold as "hypoallergenic". The term "hypoallergenic" refers only to the fact that the interior filling of the comforter does not itself cause allergy-not to whether it can become colonized with dust mites! Our comforters have a Premium Microfiber allergen-barrier exterior, and thus cannot become colonized with mites (or bedbugs). They therefore do not require encasing or hot water washing. "Be sure you get ... from a reputable company, like Mission:Allergy..." THE NEW YORK TIMES "Much Ado About Dust Mites" "Say sayonara to dust mites. Dr. Fost recommends Mission: Allergy." HEALTH MAGAZINE "How healthy is your bedroom?" "Skip the cheapie versions..invest in Mission: Allergy Premium Microfiber..." MEN'S HEALTH MAGAZINE "Clearing the Air on Allergies"
MISSION: ALLERGY brand products are specifically recommended by leading Allergy Specialists and university Allergy Departments. Designed by a Board-Certified Allergist. Medical Grade. Blocks 100% of dust mite and animal dander allergens; third-party tested by Indoor Biotechnologies, Inc. Certified bedbug-proof. MADE IN USA. Silky soft, tightly woven microfiber outside is air- and water vapor-permeable for comfort, yet water repellant. Does not need encasing. Filled with luxurious DreamFill, ultra-fine fibers that are as soft as silk, for superior lofting quality, warmth and a light, down-like feeling. This Light-Weight comforter has 60% the fill of our regular DreamFill comforters-for those desiring less warmth, or for use in place of a regular blanket. If you have any questions about this product by Mission: Allergy, contact us by completing and submitting the form below. If you are looking for a specif part number, please include it with your message.